Founder, Peter Geffen explains WHY KIVUNIM? Peter is also Founder of The Abraham Joshua Heschel School in New York, has devoted his career in Jewish education to elevating Jewish identities informed and driven by social justice, within educational models where knowledge of Jewish communities around the world propels individual and collective growth and community building for coming generations. For many of the past years KIVUNIM has journeyed within India to the Tibetan community in exile in Dharamsala. In 2018, in annual preparation for the visit, Geshe Tenzin Damchoe, one of the Dalai Lama’s disciples and a professor at the Institute of Buddhist Dialectics in Dharamsala came to Jerusalem to teach our unit on Buddhism. His visit added a powerful dimension to our already sincere and deep relationship to the Tibetan Buddhist community. Upon our arrival in Dharamsala, we were informed that His Holiness wished to meet with our students and this video, taken by his technical staff, allows you to share in this profound, gentle, and historic event. Filmed over the course of 8 life-changing months in Israel, Turkey, Bulgaria, Greece, Jordan, Italy, Spain, Morocco, Germany, the Czech Republic, Hungary and India. KIVUNIM goes to Errashadiyya and paints a synagogue! Woo! Filmed and Edited by Israel Ben-Asher. I do not own any of the music in this video. All credit goes to Matisyahu. 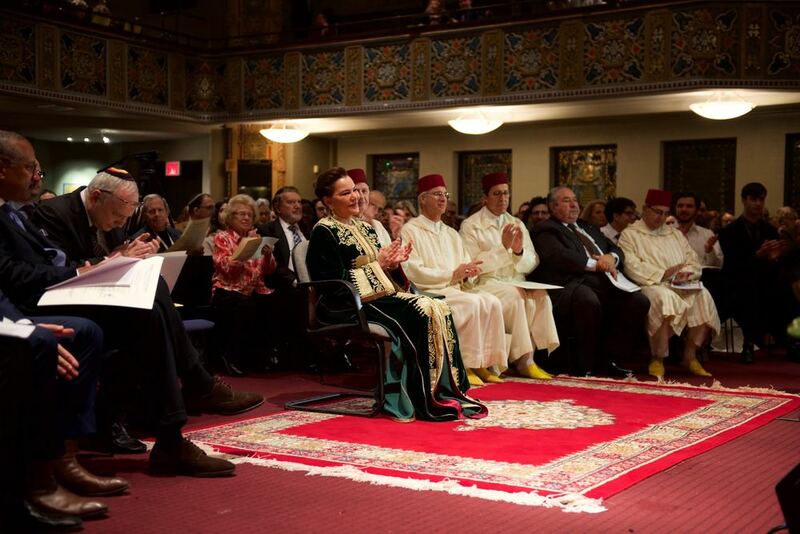 Her Highness, Princess Lalla Hasna of Morocco at the ceremony honoring her Grandfather, His Majesty the late King Mohammed V of Morocco (right of the Princess) The Hon. Andre Azoulay, Counselor to the King; Ambassador Rachad Bouhlal, Ambassador of the Kingdom of Morocco to the United States; Ambassador Omay Hilale, Ambassador to the UN; Serge Berdugo, Ambassador-at-Large of the Kingdom of Morocco and President of the Moroccan Jewish Communities; and Counsul General (NYC) Mohammed Benabdeljalil. 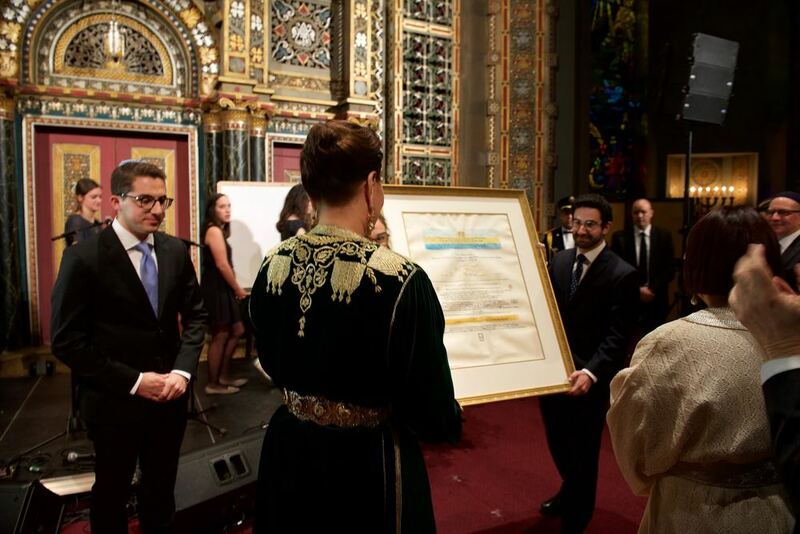 Princess Lalla Hasna of Morocco receiving the KIVUNIM award from Conference Co-chair Jonathan Edelman and KIVUNIM alum Ben Perlstein. Peter Geffen, Founder of KIVUNIM welcoming the 700 guests to the Convocation in honor of King Mohammed V.
KIVUNIM@10 Conference Co-chair Eliana Lauter reading the text of the magnificent hand calligraphed and illuminated award with Priness Lalla Hasna in the foreground. Below please find history being made: A recording of most of the evening’s program beginning with the introduction by Peter Geffen, KIVUNIM’s Founder followed by a full report from Morocco Television News of Sunday night December 20, 2015 where the first Reverend Martin Luther King, Jr. • Rabbi Abraham Joshua Heschel Award was presented to His Majesty, the late King Mohammed V of Morocco in recognition and appreciation of his heroic actions in protecting the Jews of Morocco from the racist anti-Jewish legislation of the French colonial Vichy Government. The award was received by Mohammed V’s granddaughter and sister of King Mohammed VI, Her Highness, Princess Lalla Hasna. The evening concluded with a magnificent concert of Hebrew and Arabic music by world famous singer and composer (and KIVUNIM advisory Board member) David Broza, together with Eurovision award winning singer and actress, Palestinian-Israeli Mira Awad and the immensely talented Palestinian Qanun player and singer, Ali Paris. Together with our friends and colleagues of the Mimouna Foundation in Morocco, KIVUNIM co-sponsored the first Holocaust Conference in the Arab World in September 2012. Read the full story of this historic and major event by clicking the button below.